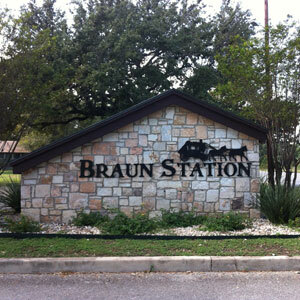 Braun Station East is a community located in Northwest San Antonio. With 626 homes, it has been noted as "The Best Little Neighborhood in San Antonio." The Board has voted to keep the assessments at $220 for 2017. Invoices will be mailed out in late November. Payments are due January 1st, 2017. Late Charges will be applied on all payments made after January 31st. It's the holiday season again!!! As the holidays are quickly approaching, let us not forget the BSE annual Christmas decorating contest. Most of us enjoy decorating our home. We love having people drive through the neighborhood admiring our beautiful lights and decorations. If you are planning to participate in this year's contest, the judging will end on December 15th. Braun Station residents are invided to join us at the Braun Station East Clubhouse & Pool for a special family event: Our Mini Christmas Village. Come enjoy the festivities on Saturday, December 3rd, 2016 from 1:00-5:00pm. Santa will arrive at 2:30pm. Plan to take pictures with Santa. Because Santa will be busy taking pictures, your children can bring their letters for Santa and drop then in the North Pole Express Mailbox located in the village. If you would like your children to receive a letter back from Santa, please provide a little information about your child so Santa can personalize the return letter. Also, include a return address. The mailbox will be receiving letters until December 15th. We want to make this a very special event for the neighborhood. There will be activities and craft projects for the kids. If you want to volunteer to help set up and/or help the day of the event, please contact Pat at 210-684-4186.